The AIC Podcast Homily series for all the Sundays in the 1928 Book of Common Prayer continues this week with the posting of the homily for Sexagesima Sunday, the second of three homilies for “Gesima” Season. Scripture includes 2 Corinthians 11:10-31, which is St. Paul’s advice, and personal history, on enduring adversity for the sake of the Christian Faith, and Luke 8:4-15, the Parable of the Sower. Listen to the Podcast Homily. The Sower by James Tissot, part of the Life of Christ series placed in the public domain by the Brooklyn Museum. The entire series includes over 500 illustrations, including sketches and sketchbooks. The Parable of the Sower is quite similar to the parable of the Wheat and the Tares in St. Matthew’s Gospel. For the Podcast Homily I have attempted to explain, in terms compatible with the practice of Christian Spirituality, each of the characters and situations, as Jesus Himself explained them to the Disciples. 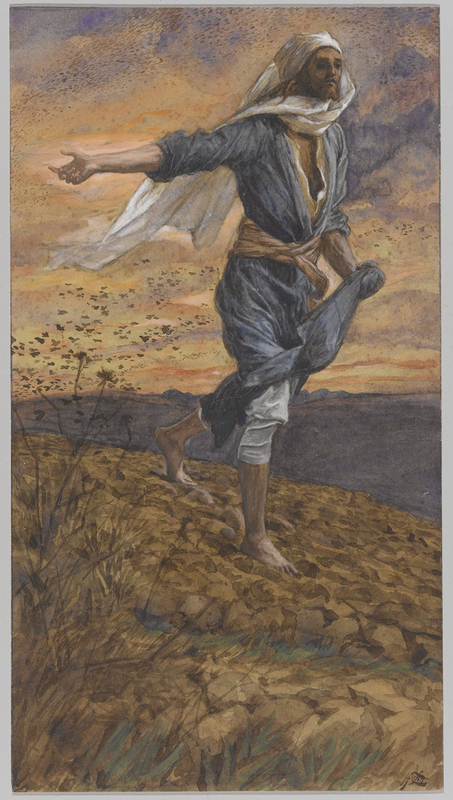 I’ve included with this Blog posting a miniature of The Sower, one of the wonderful illustrations by French artist James Tissot that are now at the Brooklyn Museum. The Brooklyn Museum has placed these works, over 500 of them, into the public domain. Many of the pictures are not on display in 2015. They are called the Life of Christ series and are accessible for viewing on the Museum’s web site. The collection also includes several sets of sketches which Tissot prepared as work studies before completion of the final works. Each is a watercolor, highlighted with charcoal, on grey wove paper. Tissot’s collection was completed in the late 1880s. This week I have also been working on Episode 38, the next installment of our on-going Bible Study series (New Testament: Gospels and Epistles) which is posted on the AIC’s You Tube channel. Episode 38 is focused on the dialogue that followed the Healing of the Blind Man and also the final unique “sign” in St. John’s Gospel, the Raising of Lazarus. Next week’s blog post will include a 14th Century egg tempera and gold leaf Byzantine-style depiction of the Raising of Lazarus, plus another version by Rembrandt in the Western style.